While Dutch cuisine is world-renowned for its cheeses and beloved stroopwafels, there is much more diversity to it. And the best part is that everyone can cook it: no matter if your mom already moves towards the fire alarm when she sees you going into the kitchen or if your friends want to come over for dinner suspiciously often, the Dutch kitchen will allow chefs of all levels to eat their hearts out. And Groningen is the current owner of the title Metropolis of Taste 2011, so there’s no better place to explore the fair and fresh cuisine of the Netherlands. It’s of course impossible to generalize about the Dutch kitchen, but here’s a short introduction. Dutch love bread, and not just for breakfast. Most students bring their own lunch to university, which often consists of homemade sandwiches. Dutch bread is made from yeast dough, which makes it airy, and whole grain is the most popular kind. It is always freshly baked, even when you buy it at a supermarket. Nutritious and delicious! And you can buy practically anything as a topping, from cheese to “hagelslag” (chocolate sprinkles) and even speculaas. Dinners are perhaps when the Dutch have their most distinctive food: meal soups and ‘stamppot’, literally translating to ‘mash pot’. Stamppot, as the name already reveals, is a dish made by mashing potatoes with one or more vegetables. 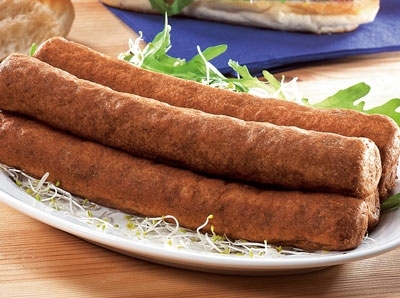 With sauerkraut, endive, carrots and onions: you name it, and you can mash it with the special “stamper.” Rookworst (smoked sausage) is the preferred meat to go with stamppot, but everyone has their own favorite recipes. It’s ideal to prepare for a large group, and very cheap. Pea soup or “erwtensoep” is the best-known meal soup, and traditionally associated with consumption after ice skating. It’s made of green split peas, and often contains potato cubes, celery, onions, pork, and smoked sausage. It’s served with rye bread and bacon, but again, after generations of modifications the recipes will differ per person. 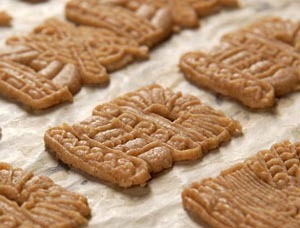 But there are also a few things that can be enjoyed year-round, such as snacks that are unique to the country. 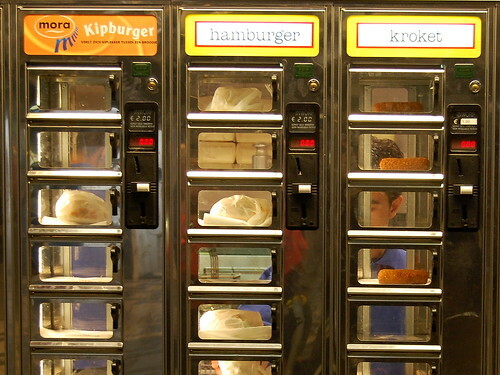 Cafeterias (called “snackbars” in Dutch) are the cheapest way of eating when you don’t feel like cooking, and are the perfect place to sample some of these Dutch snacks. 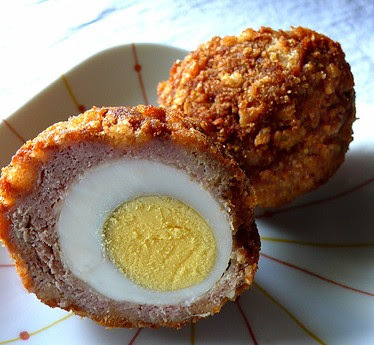 You’ve probably heard of the frikandel and kroket (deepfried meat ragout rolled in breadcrumbs), but what about the typically Groninger eierbal (egg ball)? And if you’re having a bad hair day after a wild night out, you can even avoid the cafeteria employees and get your snacks out of the wall –which also comes in handy if the service counter is closed. And you don’t have to pay all that much to enjoy healthy and delicious food. Groningen itself is home to a wide range of restaurants, lunchrooms and cafeterias, many of which offer student discounts and student meals. But of course you’ll do most of the cooking yourself or with your friends, so you’ll need to do some grocery shopping. The Albert Heijn supermarkets, lovingly called “Appie,” are located all over town. “Meeten bij de Appie om 6u?” is a phrase you will hear often during your time here. 6PM might seem early, but Dutch students eat between 6 and 7 normally. For fresh fruit, vegetables, fish, meat and other produce, the cheapest option is to go to the market stands, which take over de Vismarkt every Tuesday, Friday and Saturday. You can even hone your negotiation skills by trying to get the best price from the merchants, even though the prices are already more than reasonable. And of course, you cannot get all that delicious food down without a good drink to accompany it. The Dutch are most famous for their beers: Heineken, Grolsch, Amstel. If you’ve ever seen a Hollywood film, you have seen a good-looking male drink a Heineken. There are also many regional liquors or beers, you can even buy Groninger beer in supermarkets! For the rest, there is of course the fair share of soft drinks and juices.